To hear Docker CEO Ben Golub tell it, when a Docker sales reps pay a visit to an organization that turns out to be interested in cobbling together its own containerized infrastructure, using the Kubernetes open source orchestrator and associated tools, the rep schedules a reminder to call the org again in a few months, just to check in again. More often than not, these efforts fail, Golub explained. “It’s very hard for a team of five in a company to replicate what a team of 150 have done in Docker over the past two years,” he said. Even if the organization successfully builds out a platform, it still must scramble to assure support from multiple vendors. “So for us, Kubernetes is an interesting technology but it is not a particular competitive threat,” Golub said, in a press luncheon at DockerCon 2017, held last week in Austin. Over the past year or so, much of the buzz around containers have gravitated to Kubernetes, container orchestration software open sourced by Google. Especially after the successful KubeCon Europe conference last month, the software is being increasingly touted as the logical cornerstone for running cloud-native applications. But buzz does not alone a successful enterprise technology make, in Golub’s eyes. 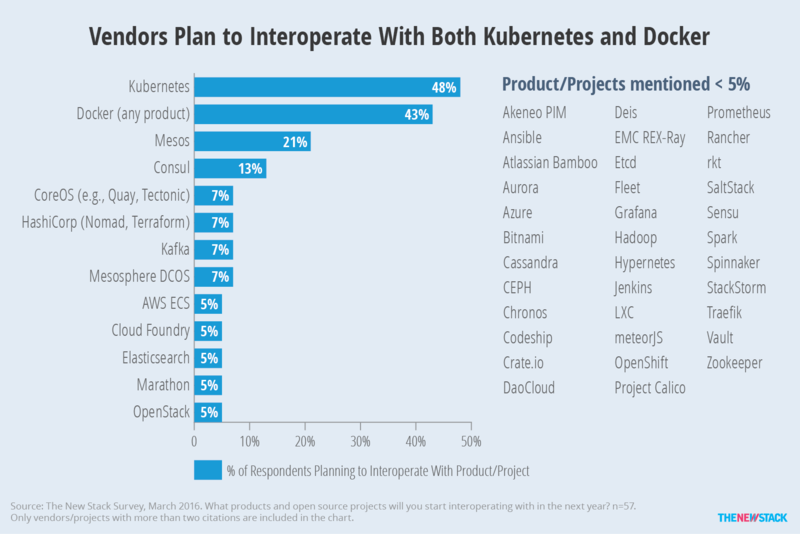 In competitive sales calls, Docker doesn’t so much see Kubernetes as much as other full-fledged container cloud platforms, such as Red Hat’s OpenShift or various other platform-as-a-service, or container-as-a-service providers, Golub said. “Docker is not just about containers,” Golub said. At DockerCon, the company stressed how much it has been doing to meet the needs of the enterprise. And it was RedMonk analyst Fintan Ryan who pointed out to us that this year’s average DockerCon attendee was a bit older, perhaps a bit more conservatively addressed than in years past. In other words, the enterprise managers were in attendance, and willing to see what Docker could do. 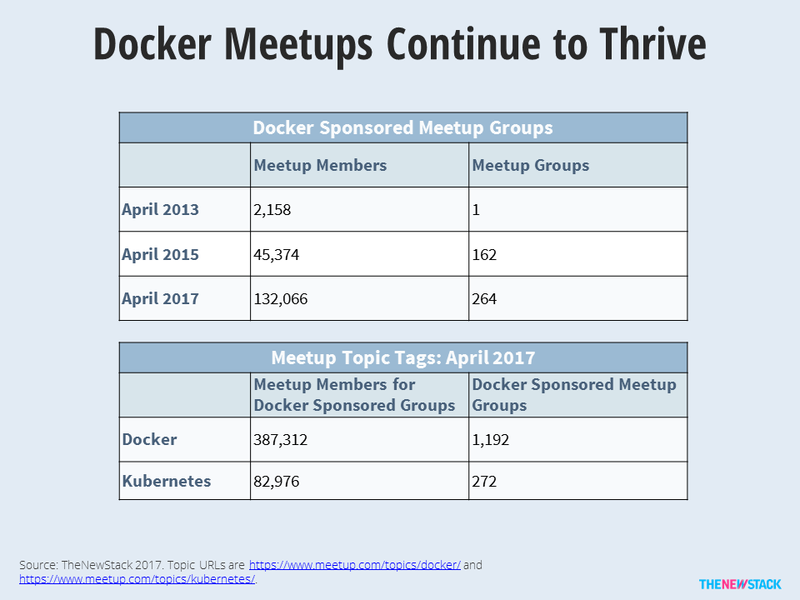 Docker meetups still vastly outnumber ones for Kubernetes (TNS analyst Lawrence Hecht). To this end, DockerCon was brimming with new product and services launches around equipping containers for the enterprise. For instance, Oracle has prepared its extensive line of databases, middleware and developer tools so they can be accessed from the recently launched Docker Store, Docker’s marketplace for containerized applications. 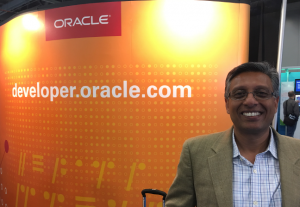 “The goal is to remove any friction from people using Oracle content in their Docker infrastructure,” said Sidhartha Argawal, Oracle vice president for product management and strategy. The initial batch of Oracle software releases includes the Oracle Database, Oracle MySQL, the Oracle Java 8 SE Runtime Environment, Oracle WebLogic Server, Oracle Coherence and Oracle Instant Client. Over time, additional Oracle software will also be containerized and stocked in Docker Store. Pricing will work the same as with the regular Oracle procurement process, with most software being freely available for testing and development, and licensed for production work. Users can pay for production copies through their existing licensing agreements if they are already in place. To further grease the wheels, the company is offering $300 in credits to test out these containerized apps. From Oracle’s current perspective, containers are chiefly useful as a way to streamline the continuous integration and deployment of software. “The pipeline of taking something through the DevTest process, through the build process is made easy by Docker itself,” Argawal said. Over time, containerization may move more towards a containers-as-a-service (CaaS), such as the Oracle Container Service, which takes care of these duties. Oracle sees two types of it customers interested in containers, he further elaborated. One is intensely interested (but still early on) in building out a cloud-native infrastructure ala Netflix. This group of customers is most interested in keeping as much control over the infrastructure as possible. The other part of the user base is also interested in containers, though has quite a bit of legacy software that it must maintain. Turns out Docker itself has been intensely interested in serving the needs of this group of enterprise users as well. Ecosystem partners have plans for both Docker and Kubernetes (TNS analyst Lawrence Hecht). “Whenever we start engaging with an enterprise customer, the first question is inevitably is ‘how do I get started on this journey to microservices?’,” said Scott Johnston, Docker chief operating officer. At the conference, the company introduced a new program to help organizations move legacy applications into containers. It is, according to Johnston, a natural first step on the path to a containerized infrastructure. Although much of the early efforts around container usage has revolved around building new applications, most enterprises spend the bulk of their IT budgets — upwards of 80 percent— on maintaining current applications. The company wants to “meet them where they are,” Johnston said. As a result, Docker has set up a professional services offering designed to help an organization get some container-based operations up and running within a week. The services are availability from system providers such as Microsoft, HPE, Cisco, and Avanade, a systems company formed as a partnership between Microsoft and Accenture. 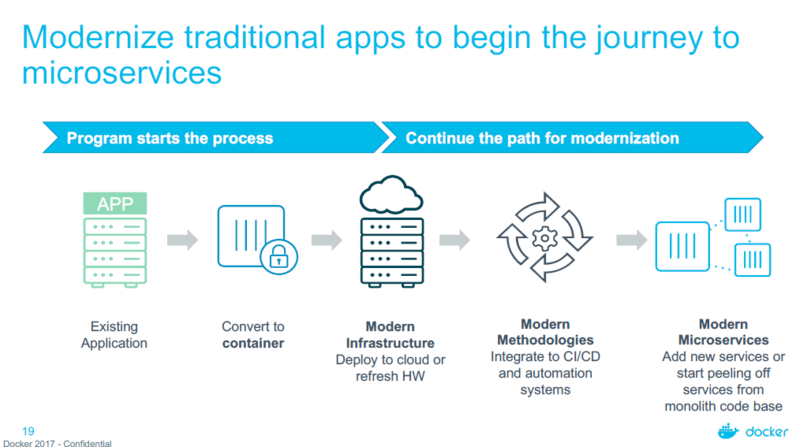 In a five-day process, the Modernize Traditional Applications (MTA) program walks clients through moving a legacy app to a containerized platform. “We can take an existing application, and with some automation and methodologies, and containerize them. We don’t have to go back to source code, nor do we have to re-architect the app,” Johnston said. The resulting stack is built using the Docker Enterprise Edition (EE) and uses templated stacks for the hybrid cloud infrastructure offerings from partners. Once in place, the resulting infrastructure promises to cut provisioning time for new applications by 75 percent, as well as lessen the need for virtual machines and makes the apps more portable. The initial applications for this service are not so much the gargantuan enterprise applications, such as SAP or Peoplesoft, but rather the small custom-built line-of-business applications rendered in .Net and enterprise Java that need to move off of aging servers and into the cloud. The automation tooling that Docker built for moving these apps seamlessly into containers will be expanded to support more types of apps in the future, Johnston said. “Lift-and-shift got a bad name in some quarters of the marketplace because it allows bad architecture to persist. But we like to say ‘This is not your grandfather’s lift-and-shift.’ This is modernizing a legacy app, but it gets you on a journey to microservices,” Johnston said. 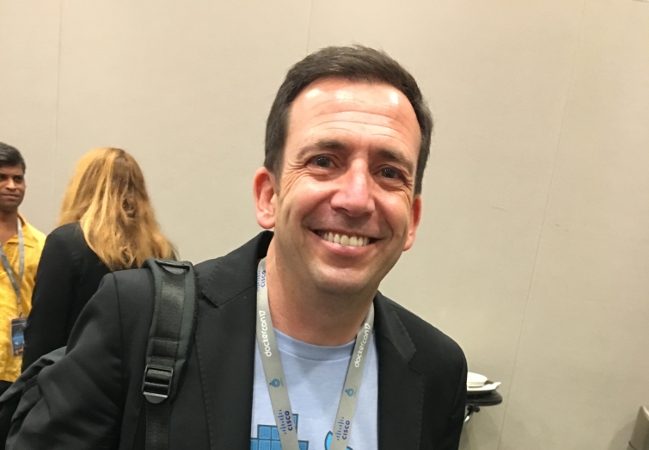 Feature image: Docker CEO Ben Golub at DockerCon 2017.